Our 3rd BDay celebration is slowly ending. 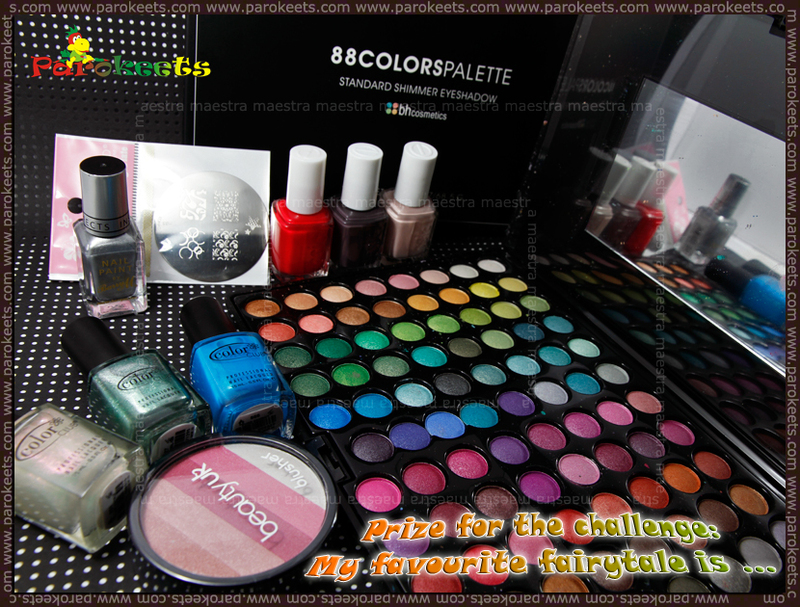 Last prize will go to the winner of our Parokeets challenge: My favourite fairytale is … challenge. And you, dear readers, will decide which photo is the best and will get the prize donated by two great companies Čarodejka and Licila.si. All the ladies did fantastic job. Just look at all the awesome manicures and make-up. MATEJA – My favorite fairytale is Tangled. When I look at this sweet girl with golden hair and lilac dress I got inspired to do this manicure. I wanted to do something I can wear normally. And because I’m not good at drawing I decided to do stamping instead. I used Catrice Lucky in lilac and Barry M Gold foil. 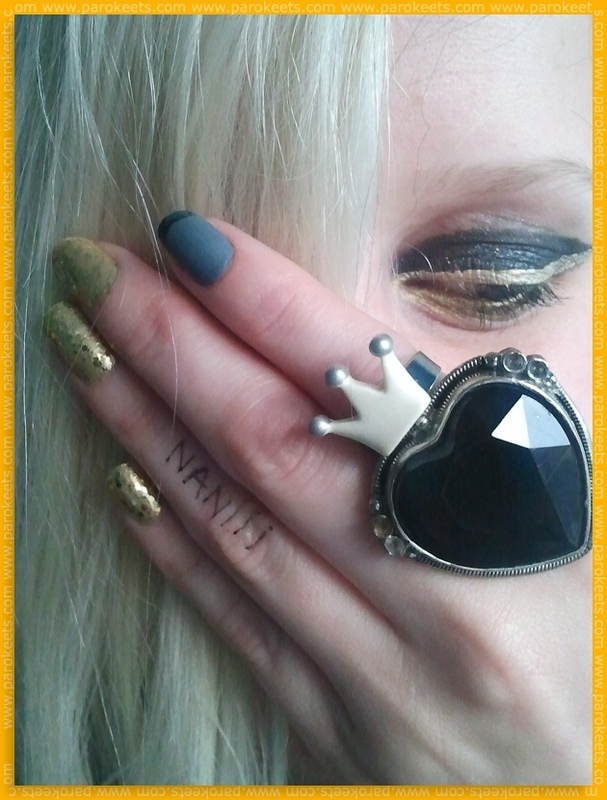 NANIII – This is my interpretation of the classic Rapunzel story it involves gold nail polish with gold glitter and a single gray nail that represents the tower. The gold represents Rapunzel’s hair. The eye make up fits the ring. Just so not everything would look so Grimm there is a sliver of gold in the eyeshadow that represents hope for the rescue of the princess. 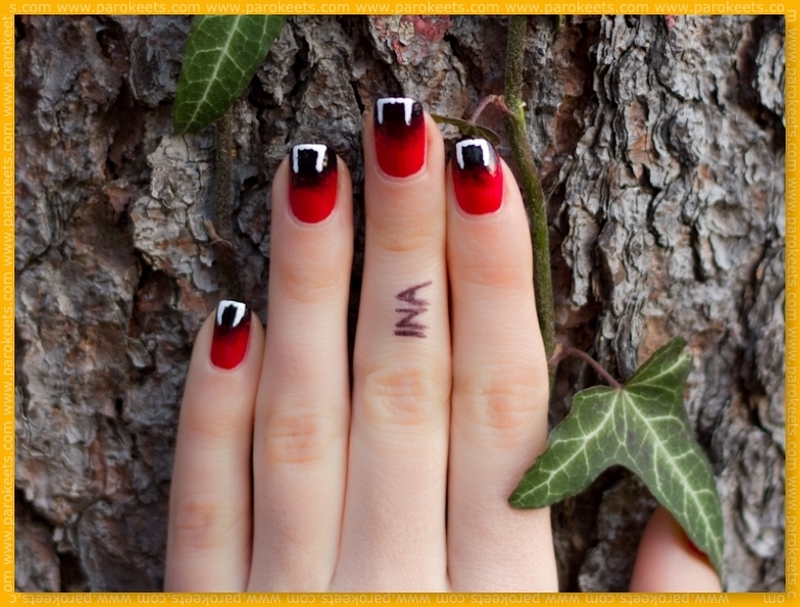 INA – I decided to enter this challenge with Little red riding hood inspired nails. This has been my favourite fairytale since I can remember. My mother read it to me all the time when I was little. I still like it because it has a little bit of darkness in it, just like this mani. Red represents little red riding hood and the black is the darkness of the woods. Everything is finished with white wolf fangs details. MAJA – My favourite fairytale from childhood is a story written by Slovenian poet Kajetan Kovič, named Pajacek in punčka. I always remember it with joy, because it was the first book I read and it inspired me to read more fairytales and also many less entertaining books. 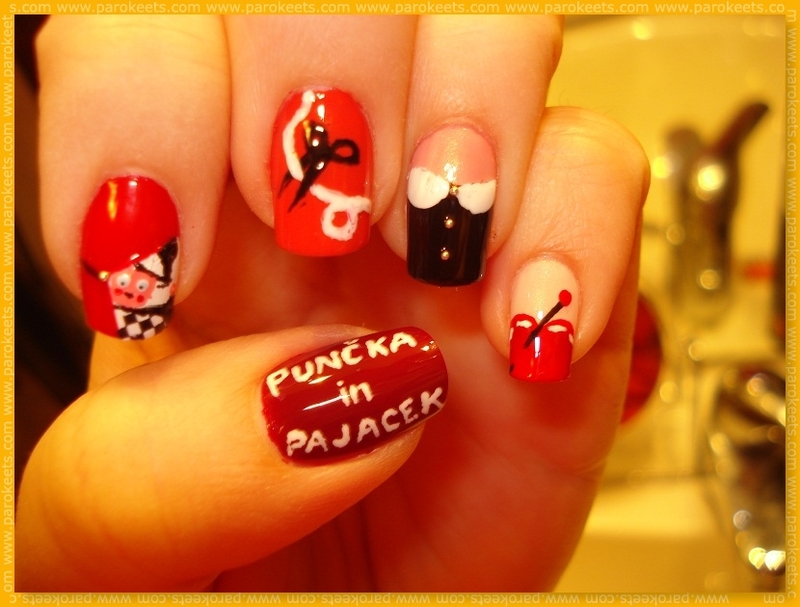 But more than the story itself I love illustrations by Jelka Reichman…which inspired me for this manicure. That’s it, thanks for your attention. URŠKA – Zvezdica Zaspanka (Sleepy Star) is my favorite fairytale, precisely because it is so similar to me. When I was younger I also like to sleep a lot, as well as I like to do now I also like how this fairytale teaches children responsibility. ANJA – I loved fairytales already as a little child. I remember how I listened to tapes, watched TV and read books for hours. I liked them all but my favourite by far was The Little Mermaid. I knew the cartoon by heart. Mermaids were (and they still are!) one of the most fascinating thing to me. As my inspiration I chose their tail – at first sight it looks somehow plain, but on the right light its magic reaches out. ANKA – I was not sure which fairytale story to choose, because when I was little I liked reading and listening to the tape of “Zvezdica zaspanka” (The little sleepy star”, with which I still have lot in common – I love sleeping and I have blonde hair). In the end I decided for the story I loved the most – Snow White. Whit the red paint I wanted to present her bright red lips and the love that she felt for the animals. 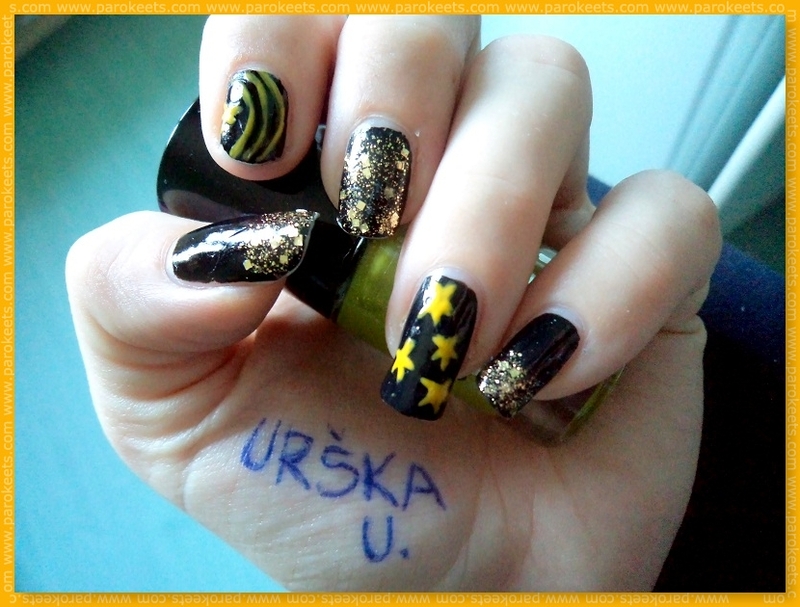 I made the pictures with Konad templates (especially M83) and a golden Barry M Gold Foil lacquer. 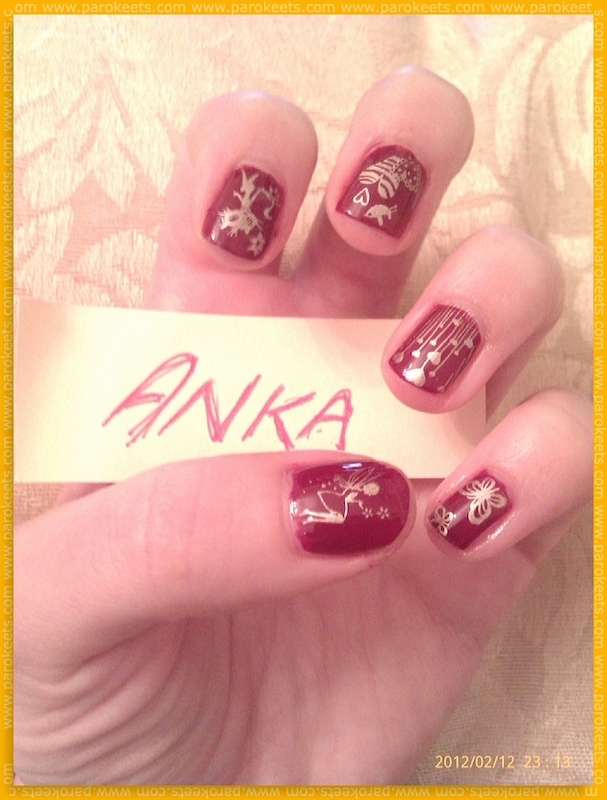 The red color is a Manhattans nail lacquer. You can vote ONLY in the poll (placed on the right side of the blog and in this post), but to be able to vote, you’ll have to be logged/registered into Parokeets blog. You can vote only once. Feel free to share your opinions in the comments, but those votes do not count. Voting will end on 17th of February 2012 at 10pm (GMT+1). Girls – you’re voting on a blog run by IT expert … just a word of warning for all of those who think that we will not enforce ONE vote per person rule. Nekateri očitno pozabljajo, da Parokeets blog administrira strokovnjak za informatiko in računalništvo. V vednost vsem – pravilo en glas – ena oseba se bo striktno uveljavljalo. 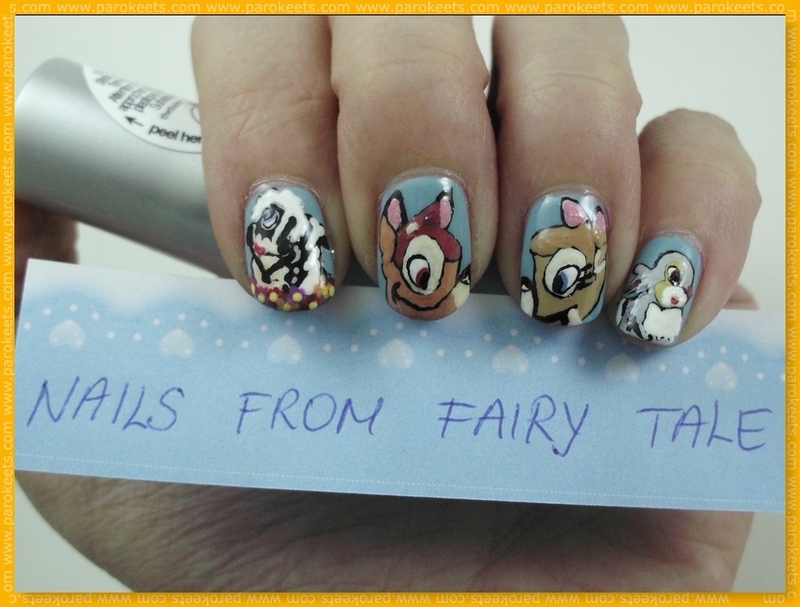 I love the Bambi one! :wub: Very creative! i can’t vote? i can only see the results..
Jesi li se uspjela logirati u WordPress? Punce zelo ste se potrudile in se za enkrat ne morem odločiti, katera bo dobila moj glas.